While options trading can earn you significant profits, betting on the future is always risky. This makes options trading speculative in nature. Options trading is a form of derivative trading that requires an investor to bet on the future value of a security. While options trading can earn you significant profits, betting on the future is always risky. This makes options trading speculative in nature. To successfully bet on the future and build your wealth in the process, you must have the skills and traits that all successful options traders have. Interpretation of recent events: An options trader should have the knowledge to interpret news and analyze it to make better investment decisions. They should be able to differentiate what between hype and reality. A successful options trader will make a sound investment decision based on his own interpretation of the news, rather than basing it solely on the story. ​Disciplined approach: To be a successful options trader, you should practice discipline. This means that before investing in a stock, you should perform extensive research about the company, identify investing opportunities, set financial goals, determine an exit strategy, avoid the opinion of the herd, and create personalized trading strategies. Practice patience: An options trader should be patient when it comes to market trends and should not take an investment decision in a hurry. Successful options traders often wait for long periods for the right opportunity to sell or buy an option. You should be patient and wait as long you have to until the market provides you with the perfect time to enter and exit a trade. Quantum of risk: As options trading involves a high amount of risk, it is necessary for a person to know the quantum of risk he/she has to take while trading. You should first determine what you stand to lose and how much of your money is allocated to a single investment. To manage risk, diversification and limiting the trade size to a certain level can prove helpful. Style of trading: Every trader has his/her own trading style. 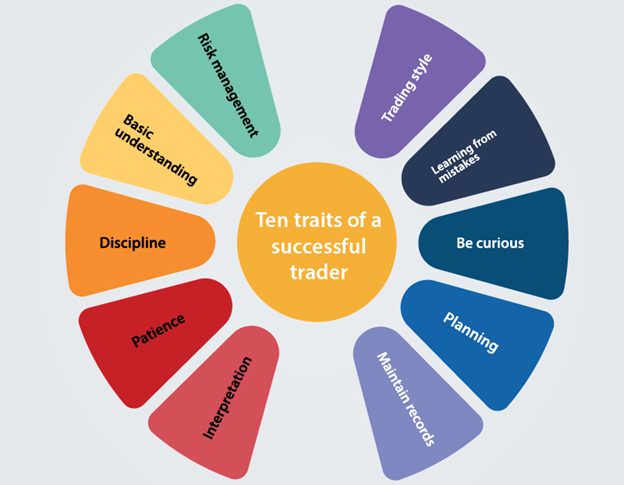 To be successful, it is important to identify what trading style suits you perfectly. Some may find intra-day trading to be a good option; some may realize that they can use time decay to their advantage and choose positions trading, while some may think that they require longer to sort things out and pick swing trading. Whatever you choose, it is important that you determine what suits your trading style and your personality perfectly. Understanding the Basics: An options trader has to understand some basic terms that are used while trading. Option Greeks like delta, theta, gamma, and vega are used to identify various terms in options trading. A options trader should have knowledge about these terms to understand the process of options trading better. Keep records: All successful options traders maintain records of their transactions. If you want to improve your odds, you should keep a proper record of your trades as it will help you analyze your decisions and you can learn from your past mistakes. Maintaining proper trade records is essential as it can allow you to avoid repeating bad investment decisions. Be curious about the market: The market is dynamic and volatile, and hence, can change in the blink of an eye. You must clearly understand the factors that influence the market. Curiosity will help you constantly look for answers to doubts. It will allow you to acquire much-needed knowledge about the options trade and knowledge is what makes a trader successful. Planning: Successful options trading requires traders to plan their trade. A trader who plans a trade is more likely to make profits than the one who takes decisions randomly. Planning will help you set some financial goals, and all of your decisions will be based on achieving these goals. Without planning, you will be directionless and will have to trade blindly and trading blindly results in nothing but losses. Analyzing past mistakes: To be able to make profits in the options market, you should learn from your mistakes. There is a high possibility that you will incur losses in the beginning, but it shouldn’t mean that you give up. Analyze your mistakes and identify what you did wrong and do everything in your power to avoid committing the same mistake again.